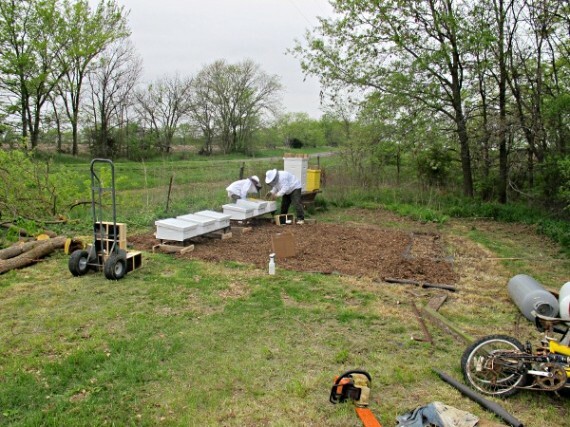 Previous 2012 installation post: #2: Installing the 2012 Bees. This year, I Sharpied the year on each of the frames. 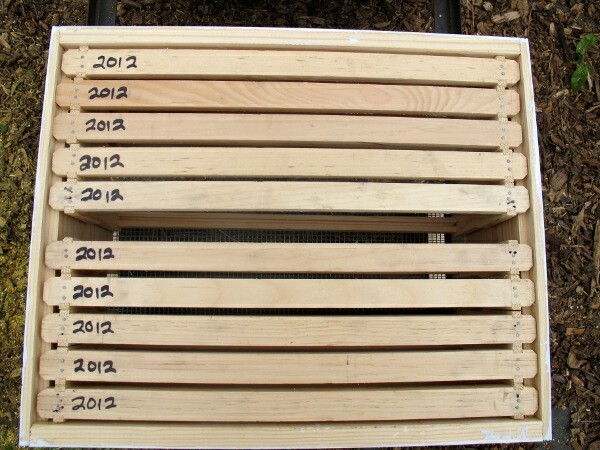 This serves two purposes: (1) Obviously, to mark the age of the frames so I can rotate out frames with some sort of regularity if needed; and (2) For orientation — so once we start slinging frames around during inspections, we know which way to put them back in. I don’t figure the bees appreciate us rearranging their furniture more than we already do. 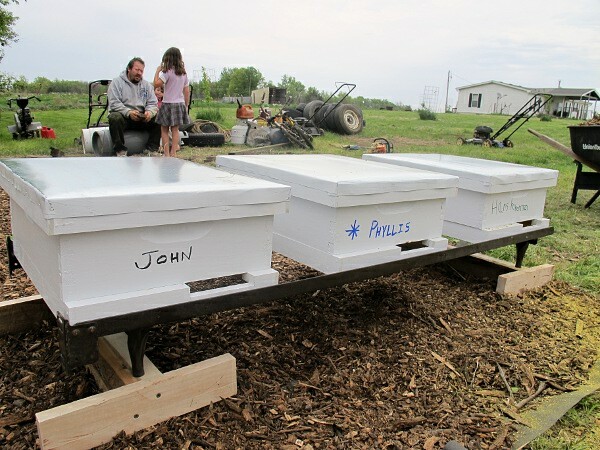 With eight hives going now, we decided we’d better come up with some names to help keep everything straight. Some of the kids helped name them and then the girls “decorated” a couple. Meet John (Wayne/Denver), Phyllis (Diller), and Hans Huberman. You can see the screened bottom boards here that Steve made. He made the entrances just big enough for a boardman feeder plus a “service entrance” for the bees to haul out dead bodies. We’re going with top entrances this year for the main entrances. Steve will build the top entrances into the inner covers he’ll be making (hopefully) tonight. The backside of John, Phyllis, and Hans Huberman. Notice the hive stands? 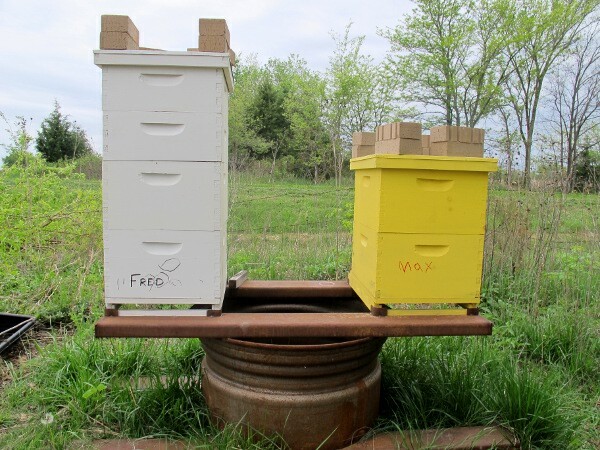 Steve pulled up a couple of old bed frames from the basement and, with a whiz of the saw and a zap of the welder, we had hive stands. How cool, right?? The hollow legs are resting on nails in 2 x 4 bases to keep them steady & sturdy when certain uncoordinated people run into things. Quit looking at me! Here are Fang (because you can’t have Phyllis without Fang), Snow White (Nellie’s pick for a name), and Honey (Josie’s pick — she’s very practical, you see). 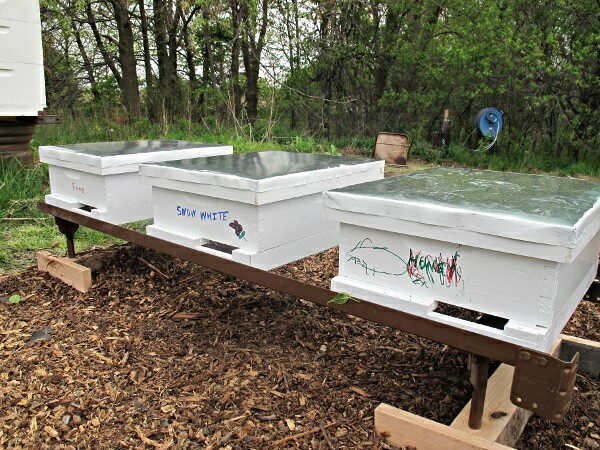 Of course, we then had to name the two original hives. 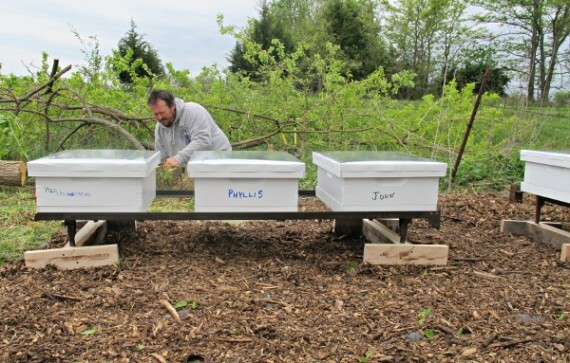 The thriving Italian hive is now Fred (McMurray) and the %#&^@#%* Carniolans are now Max (Charlie’s hive). Maybe the name “Max” will inspire the lazy bums to actually do something to live up to their new name. We need to work some weed cloth & wood chips around these hives, too. 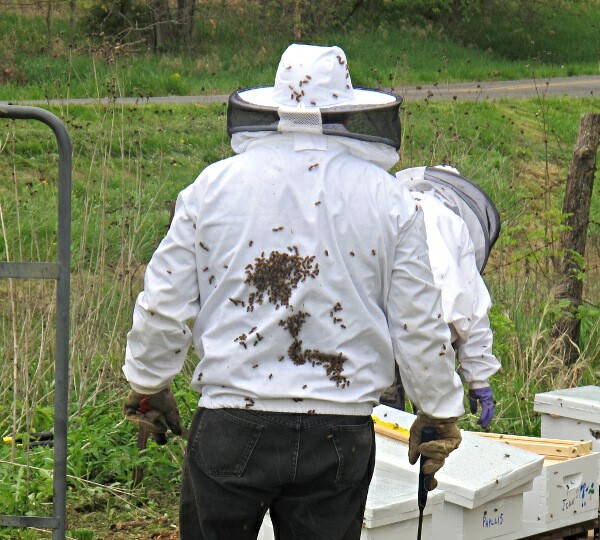 Nellie, Charlie, and I picked up the bees in the van Friday afternoon while Steve stayed home with the rest of the kids to work on that last-minute stuff. Nellie sat right by the bees and didn’t even squeal! She sat back there and giggled with delight. Then the bees had to spend the night in the van so we could finish things up for them. We didn’t actually get started installing until early Saturday afternoon. Let the dumping begin! Steve & Charlie did the dirty work while I manned the camera. Notice the suits this year? (We so need another bee suit or two so more of us can be up close at a time. It’s on the to-get list!) Last year’s bees were so calm that we didn’t use suits during the installation. These suckers, though, wow. They are all feisty little boogers. Until Steve gets those inner covers with entrances built, they have their outer covers propped up with shims. And then it started to rain. It had been spitting off and on for most of the installation but it got heavier as soon as they started dumping in bees. Which, of course, made the bees that much crankier. Something about messing up their hairdos, I think. Those of us not in suits had to stand pretty far back. Thank goodness for zoom! Did you see the globs of bees on Charlie’s hat up there? And on Steve’s back? 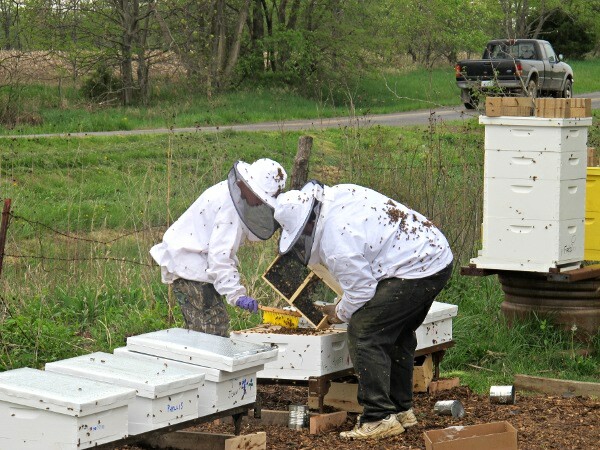 The boys laid the package boxes under the hives so they’d be out of the rain until the few remaining bees in each could find their way into the hives. Then the boys brushed each other off and walked a few feet towards the house. Then brushed again and walked a bit more. Then brushed again and walked a bit more. And so on. I’m expecting they’ll make it back into the house by Thanksgiving or so. 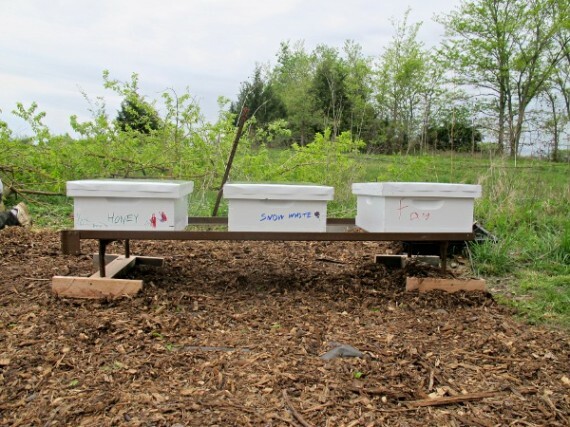 While these bees were cranky little snots from the get-go, they sure were healthy. By healthy, I mean not dead. Last year’s bees had quite a few dead bees in the bottom of the box, as is the norm. This year, there are hardly any at all. Will get to the releasing of the queens post tomorrow. Wow, these are great! 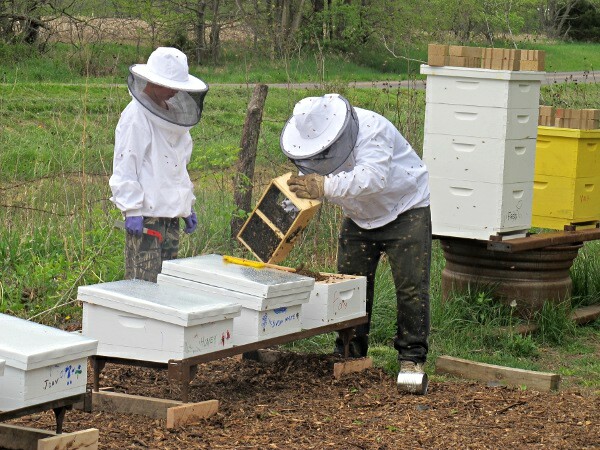 My daughter finally figured out what she wants to do (my oldest son just bought bantams)Bees! So these posts are very inspiring…especially all the down home equipment that I can relate to!! I told her that we are going to read about it for a year then- look out! I love seeing how your whole family is involved-that is super neat! Very cool! How old is she? er, well, um…12. We start hobbies early around here. I had planned on being a big “help”. Nice! Our main beekeeper in this family is our 11 year old.